With a new map exhibit, the Philippines tries to repudiate China’s historical claims to South China Sea territories. On Thursday, the Philippines took aim at China’s capacious claim to almost the entirety of the South China Sea by exhibiting 60 ancient maps which it claims demonstrate that Beijing’s territorial assertions are recent fabrications — not immutable historical facts. To borrow a term, it seems that Philippines is playing China’s “mapfare” game, fighting fire with fire. The Philippines and China have been engaged in a protracted dispute over islets and shoals in the South China Sea. 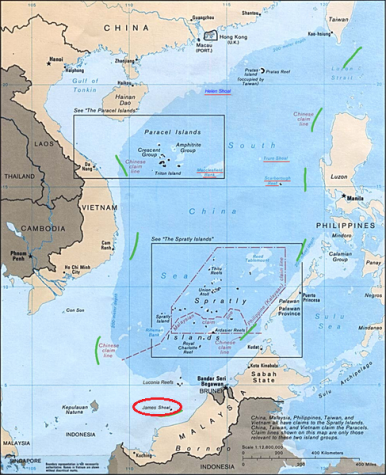 In 2012, following a stand-off, China seized control of the Scarborough Shoal from the Philippines. Recently, the Philippines put forth a proposal at the ASEAN Regional Forum (ARF) that sought to ban all construction activities in the South China Sea. The proposal did not pass and China continues to remain engaged in the region. According to Reuters, the exhibit contained maps that demonstrate that “from the Song Dynasty in the year 960 until the end of the Qing Dynasty early in the 20th century, China’s southernmost territory was always Hainan island, just off the Chinese coast.” The maps in the exhibit also note that the Scarborough Shoal — the most significant disputed territory between China and the Philippines — makes no appearances on maps prior to 1636. In maps published after that date, the shoal is shown as Filipino territory. The exhibit takes aim at China’s repeated claim that its territorial claims are based on historical fact. Philippines officials are trying to cast light upon what they perceive to be “historical lies,” as Philippines Supreme Court Associate Justice Antonio Carpio put it. This exhibit also follows on the heels of China revealing its new official map earlier this summer — the same map in which it “upgraded” its dashed line claim to the South China Sea to include ten lines instead of nine. With its recent actions, including its ARF proposal and its decision to take a case to a U.N. arbitrator in The Hague, the Philippines has made it amply clear that it takes its dispute with China quite seriously. However, unlike Vietnam, it has chosen not to meet Chinese provocations by investing in asymmetric military strategy or by building its naval capacity. “Mapfare” may seem like an ineffective response to real, kinetic assertive moves by China in the South China Sea, but it plays in important role in defining the parameters of the Filipino government’s narrative. Additionally, it makes matters thornier for Beijing as it effectively means the Philippines is willing to play China’s game. It isn’t defending its claim to these territories by means of the U.N. Convention on the Law of the Sea (UNCLOS), or international norms. It sends the message that Filipino officials reject China’s historical justification for irredentism. Cartophile readers can take a look at the maps, which are being hosted online by the Philippine’s Institute for Maritime and Ocean Affairs. South China Sea: What Exactly Has Changed At Scarborough Shoal?Duterte: No Bargaining With China on South China SeaDuterte: South China Sea Talks With China 'Within The Year'US Navy Destroyers Patrol Near China’s Man-Made Islands in South China SeaDid a US ‘Line in the Sand’ at Scarborough Shoal Just Wash Away?